Discussion in 'Indian Navy' started by Manmohan Yadav, Apr 30, 2015. India Navy’s new stealth destroyer, Visakhapatnam, designed indigenously and fitted with advanced features, was launched here on Monday, boosting the maritime force’s firepower capability. The Kolkata-class warship, the first of P15-B stealth destroyers, was launched by Minu Dhowan, wife of Chief of Naval Staff Admiral R. K. Dhowan, at Mazagaon Docks Ltd (MDL).Top Navy and MDL officials were present on the occasion. The ship, weighing approximately 3,000 tonnes during the launch, is slated to be christened as ‘INS Visakhapatnam’ on commissioning. The 163-metre-long vessel will be propelled by four gas turbines, and is designed to achieve a speed of over 30 knots at a displacement of approximately 7,300 tonnes. The indigenously-designed stealth destroyer will have state-of-the-art weapons, sensors, an advance Action Information System, in Integrated Platform Management system, sophisticated Power Distribution System and a host of other advanced features. It will be fitted with supersonic surface-to-surface missile system. The system enables the ship to engage shore-based and naval surface targets at long range, making it a lethal platform for strike against enemy targets. The ship’s air defence capability, designed to counter the threat of enemy aircraft and anti-ship cruise missiles, will revolve around the vertical launch and long range surface to air missile system. Four 30 mm rapid-fire guns will provide the ship with close-in-defence capability, while an MR gun will enable her to provide effective naval gunfire support. Indigenously developed twin tube torpedo launchers and rocket launchers will add punch to the ship’s anti-submarine capability. 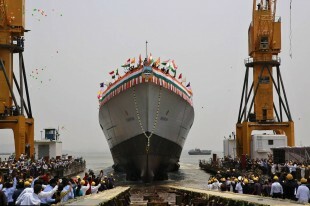 The vessel is follow-on of P15A Kolkata-class destroyers with enhanced features. The vessel is expected to be commissioned in the Navy in 2018. The indigenization content in P15-B class destroyers is a notch above her illustrious predecessors in line with the ‘Make in India policy’ of the government. The P15-B stealth destroyers have been designed by the force’s in-house unit – Directorate of Naval Design. The design of Project 15B destroyers is testimony of the Navy’s firm commitment towards achieving indigenization by using high-end technology in the field of weapons/sensors/machinery and stealth. Mazagaon Docks, the country’s premier warship building yard, is engaged in producing sophisticated world-class warships and submarines. At present four destroyers and six submarines are under various stages of construction at MDL.